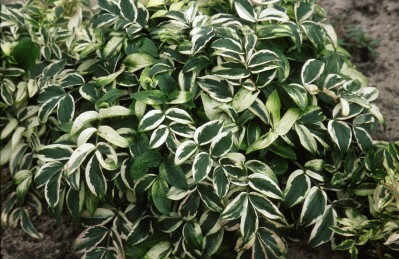 A cultivar with green foliage and a white margin tinged with pink. Pale lavender-blue flowers bloom in late spring to early summer. Likes evenly moist soil and some protection from the hot afternoon sun. Introduced by the New England Wildflower Society. Available in #1 containers. Our stock is always changing so please call for current availability.